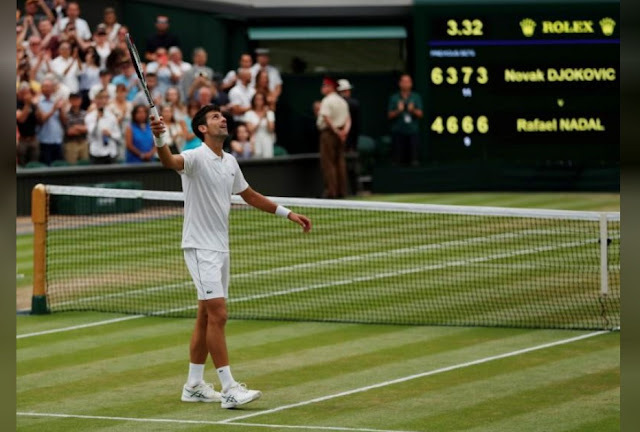 Serbia’s Novak Djokovic reached his fifth Wimbledon final as he resisted everything great rival Rafael Nadal could throw at him to win 6-4 3-6 7-6(9) 3-6 10-8 in a two-day classic that concluded in nerve-jangling tension on Saturday. Twelfth seed Djokovic resumed two sets to one ahead after snatching a third-set tiebreak the previous night before Wimbledon’s 11pm curfew left the match on a knife-edge. As it was for the first three sets the Center Court roof was closed and, again, the quality on display was sensational.